It’s possible that the trident was used for mate competition, much like the antlers of modern deer or the exaggerated mandibles of stag beetles. But that kind of adaptation is typically sexually dimorphic,* and there is no evidence of that. My amateur theory has nothing to do with intrasexual selection. To me, the trident resembles a dowsing rod turned outward. I think the trident is electroreceptive, a primitive analogue to the ampullae of Lorenzini on a shark’s face. I think the Walliserops patrolled the reef with his appendage skimming the sand in front. When it detected the electric field of hidden prey, the fork shape provided information about which way to turn (like a snake’s tongue) and then became a spade to unearth and wound his prey. The legs and antennae are not well preserved in fossilized trilobites. 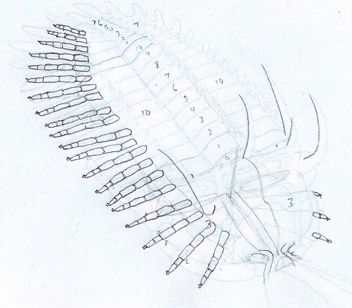 In my previous illustration, I depicted an arrangement of limbs consistent with trilobites in general. In this case, four cephalic pairs followed by one pair per segment. 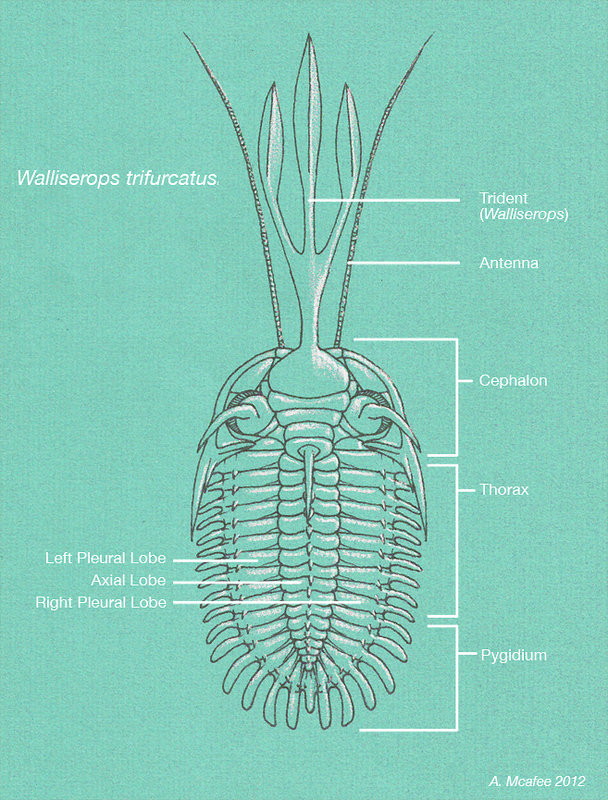 I don’t know what Walliserops antennae might have looked like, but neither does anyone else. It seems logical to me that this creature would have antennae at least as long as its proboscis. Regardless of the trident’s function, it would be useful to have a/another set of long-range sensors up front. There is evidence that some trilobites, specifically Olenoides serratus, had rear antennae-like appendages (cerci) in addition to anterior antennae. Although I have seen depictions of Walliserops with cerci, I didn’t feel that there was sufficient evidence to make that leap. The Walliserops genus is applied to only three species, all uncovered in southern Morocco from lower and middle Devonian strata. Trilobites disappeared from the earth at the end of the Permian era, about 250 million years ago. *Caribou and reindeer are an exception; antlers are an adaptive advantage to both males and females because they can be used to clear snow from nutritious vegetation. Posted Monday, June 11th, 2012 at 7:23 pm. Filed under Animals. Both comments and pings are currently closed.